The egg came first. If you follow back the evolution of the chicken, it was an egg laying bird BEFORE it became a chicken, therefore the first chicken came from an egg. Ergo the egg is first. 4 Jun 2006 @ 10:33 by Nightcrawler @144.132.30.75 : Reptiles?!? seriously people r we that dumb, of course it was the egg! just ask yourself what came first the chicken or the reptile? and another question what do reptiles lay? simple isnt it? Now, if you phrase it like this: "What came first, the egg, or an animal that laid the egg? ", I think it is quite obvious. There's no egg unless somebody laid it. But the animals in question might well have come about in other ways than by coming out of hard-shelled eggs. what came first the vision or the fact. Also from reading Genesis, who can first Cain or Eve? Did Eve produce an egg or was there just one lying around? Anyway.....seriously, what are these people getting paid for? I would say that there is no correct answer to this. It really depends on how you believe. If you believe strongly in religion, then you are most likey to believe that the chicken being put onto earth first during the creation among the other animals, not mentioning Adam and Eve. And if you believe in science, then it is obvious that you are going to argue that the egg comes first because you can prove it to us. Therefore, I would say that the answer really depends on your own belief. 1 May 2007 @ 10:53 by Matt @71.71.15.19 : Chicken or the Egg? I have a lot of respect for you, but in answer to this age old question my answer is the chicken came first. Why? Well, first off I think we need to narrow the question. Which came first the chicken or the chicken's egg. Then it becomes answerable and we can get on to other things. If you believe in evolution then at some point in history an animal, some ancestor of the chicken, lets call it a near-chicken layed a near-chicken's egg. In that near-chicken's egg was a mutated/evolved animal that could be called a chicken. After that we have chicken's eggs. So that would be the evolutional answer. In creationism the chicken was created and layed chicken's eggs. So in both cases the chicken's eggs came after the chicken. 12 Mar 2008 @ 10:56 by pamela @203.84.170.34 : ? katanga naman, nd b halata kpag ngbasa k ng children's buk,ang unang mkkita ngccmula ung cycle s itlog..bobo b? 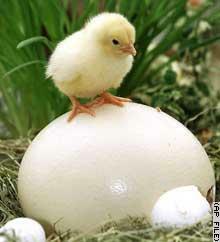 19 Jan 2012 @ 17:05 by Nautilus @99.56.221.38 : Chicken or egg? CHICKEN! Your article, dated 12 March 2008, is superceded by the work of British scientists at Sheffield and Warwick Universities. Their paper on the subject was presented on June 10, 2010. The scientists found that protein existing only in a chicken's ovaries, is necessary for the formation of an egg. Their conclusion is that the chicken came first.